Please advise exams@jcu.edu.au if you are not able to attend your nominated ceremony. It is compulsory to wear JCU approved academic dress at ceremonies. To hire or purchase JCU approved gowns for the Townsville and Cairns ceremonies please link to the official JCU graduation gown hire form at: https://www.grad360.com.au/jcu. Please assist us in making your graduation an enjoyable experience by adhering to the following instructions. During the week leading up to your ceremony you will be emailed your ceremony registration number. Please make a note of this number and bring it with you to the registration desk, being able to quote this number will speed up the registration process for you. Before you can register you must be wearing your full academic dress. NB PhD Graduates Only. When you are gowned (gown collection instructions will be provided when you complete your gown hire form) do not register as per the following instructions for all other graduates. You will be advised of your registration procedure in information sent to you approximately a week before your ceremony. Note: Graduands who register late may not be able to be presented in their correct order or if the ceremony has commenced possibly not presented at all. To allow time to park, collect your gown and photography (if time still permits) it is recommended that you arrive at the venue two hours before the ceremony commences. IMPORTANT Personal Items – For safety and security reasons you are not permitted to carry personal items (handbags / mobiles etc.) with you on to the stage during your presentation to the Chancellor. Please leave any personal items with family or friends prior to registering. Following your presentation to the Chancellor you may not return to your original seat so for security and safety reasons personal items cannot be left under seats so please leave them with family before registering. After you have registered you will be required to enter the auditorium. 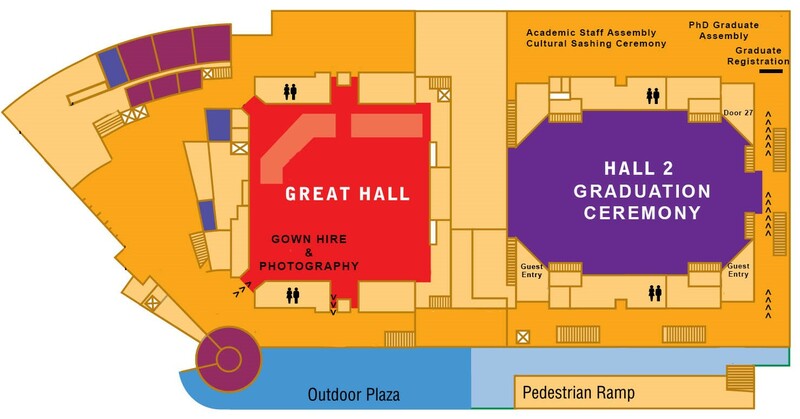 At 2.20pm, you are to assemble (gowned) in the academic assembly room. An email with more specific instructions will be sent to you approximately a week prior to the ceremony. Eligible Aboriginal and Torres Strait Islander graduates will be presented with a JCU Cultural Sash at an informal ceremony will commence 30 minutes prior to the main graduation ceremony. An invitation will be sent by email to eligible recipients prior to the ceremony date. It is anticipated that the ceremony will run for approximately two hours. You may invite as many guests as you wish, admission is free, it is not possible to reserve seats for guests. Graduands are seated in reserved seating so guests may sit in any non-reserved seats in the auditorium. The auditorium will open at 2.00pm. Smart casual, please no thongs or shorts, Neck badges and medals may be worn. Studio: Follow signs in the foyer. Studio Hours: 12.30pm.to. 2.00pm and then reopen after the ceremony. Refreshments Following the ceremony, complimentary light refreshments will be served in the foyer.